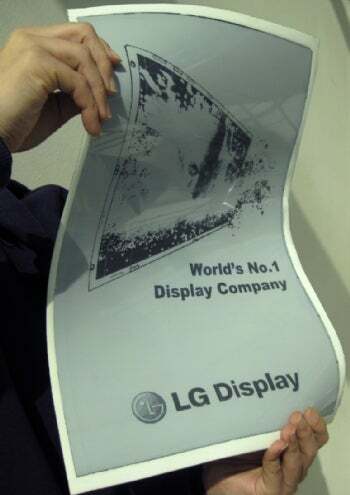 LG Display has developed a flexible electronic-paper screen that's almost as large as a tabloid newspaper, it said Thursday. The screen measures 25 centimeters by 40 centimeters, which translates into a 19-inch diagonal screen size, and is 0.3 millimeters thin so it can bend. LG Display managed to make it flexible by utilizing a metal foil instead of the more traditional glass substrate. The South Korean company said the screen is the largest flexible e-paper display yet produced. Electronic paper has already been put to use in e-book readers like Amazon's Kindle and Sony's Reader devices. It boasts a high-contrast ratio that makes it easy to read and relies on ambient light so doesn't cause eye strain over long periods of use. Additionally it only requires power when the screen is refreshed so e-paper devices typically have a long battery life. Developers are looking at flexible e-paper screens as a possible base for newspapers of the future. Such a newspaper could be updated regularly with the latest news, wouldn't require printing or distribution of a physical newspaper and contain pictures and video. LG Display said it plans to begin mass production of an 11.5-inch flexible electronic paper screen in the first half of this year. Pricing details for the new display were not announced.